LEADING LIFE SCIENCE – Bridging different disciplines is where some of the more interesting work gets done. | Experimental Designs Consulting, Inc.
Are you in industry and would like to return to academia? We have a treat for you this week. In our last show we featured Colin White, who helps academics to successfully transition into industry. However, our guest, this episode, has managed to transition from industry, BACK to academia. Many struggle to make the transition into industry, let alone back into academia. He’s not only done it, but he’s managed to develop a thriving competitive lab. We get to hear how he did it in this episode of the Leading Life Science Radio Podcast, with today’s guest, Dr. Enrique Saez. 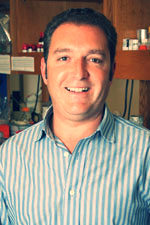 Enrique’s team focuses on genetic regulators of metabolic disorders. The Saez lab focuses on the molecular mechanisms of metabolic disorders like atherosclerosis and diabetes by understanding how genetic regulators of glucose and pathogenic forms of cholesterol work. Their hope is to uncover ways of slowing the genesis of cardiovascular disease in diabetic patients. What are the pros and cons of industry and academia? Why go back to academia? What strategy do you use to find an academic position after industry? What business skills did you learn and how has it helped your science? Where do you find the right team? Transitioning back to academia is possible, if you maintain your network through publications and collaborations. The ability to communicate across disciplines is an advantage in both business and academia. As an industry lab grows, more systems and processes develop versus a startup or an academic lab. Publications matter more in academia than in industry. Thanks to Dr. Enrique Saez for joining us today to talk about his journey to lead a team of dedicated scientists to unraveling the mysteries behind metabolic related diseases.